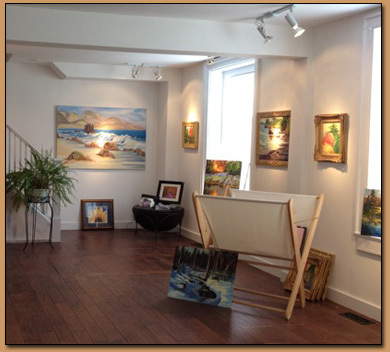 Rekindle your love of the arts with weekly lessons or weekend workshops at Windswept Studio. Get inspired by Tess! person in your life. Click here to purchase. Visa, Amex, Mastercard and Debit accepted. A list of suggested materials will be sent to you with your registration confirmation. Other materials will also be available for sale to compliment your learning. For further information please contact Tess. 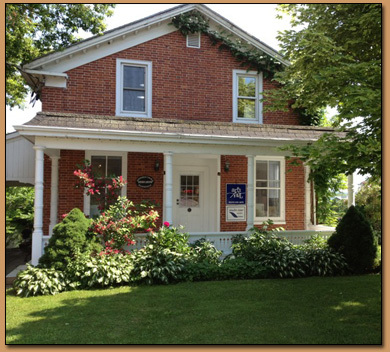 Relaxing accommodations just three doors down from Windswept Studio in the lovely Village of Bloomfield. Three bedrooms, all with ensuite baths. King, queen or twin beds. Splendid breakfasts featuring fresh, local ingredients. May through October and all month July and August. Registration has begun for both weekly classes and workshops. Guaranteed small groups of 4 to 6 students. Lots of fun and one to one attention. Classes fill quickly so sign up now. Small groups of 3-8 people guaranteed. Lots of fun and one to one attention. Seven different class times are offered. Choose a day and time that suits you and a class topic. Contact Tess to register. Class topics will run according to demand. Have fun experimenting with this versatile medium. Learn brush techniques and handy tips to render your subject. Flowers, water scenes and skies as subject matter. Colour mixing and study of colour theories applied to a variety of subject matter. Drawing what you really see! Practice drawing and improve your observation skills. Have fun experimenting with this versatile medium. Learn brush techniques and handy tips to render your subject. Florals and fall landscapes and skies as subject matter. Visa, Amex, Mastercard, and Debit accepted. Other materials will also be available for purchase to compliment your learning. N.B. Sessions fill quickly! Sign up today. Modified lesson content is available on demand to suit the needs of the students enrolled. Just ask Tess. 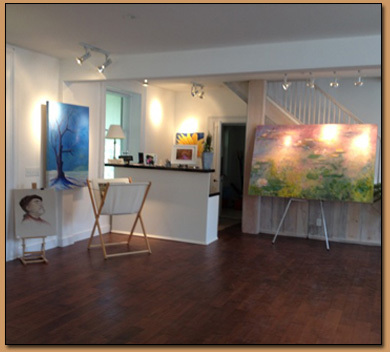 Spend a day or two rekindling your love of the arts while enjoying beautiful Prince Edward County. No art experience necessary. Tess will guide you. Small groups of 1 - 6 people guaranteed. Lots of fun and one to one attention. Spaces are limited so register early. Introduction to acrylic painting. Have fun experimenting with this versatile medium. Learn brush techniques and handy tips to render your subject. Waterscapes and fall foliage as subject matter. Introduction to oil painting. Have fun experimenting with this versatile medium. Learn brush techniques and handy tips to render your subject. More fall landscape scenes including water and skies as subject matter. Introduction to oil and acrylic painting continued. Have fun experimenting with this versatile medium. Learn brush techniques and handy tips to render your subject. Skies, clouds and fall landscapes as subject matter. Introduction to acrylic painting. Have fun experimenting with this versatile medium. Learn brush techniques and handy tips to render your subject. Beautiful florals and still life as subject matter. Introduction to oil and acrylic painting continued. Have fun experimenting with this versatile medium. Learn brush techniques and handy tips to render your subject. Skies, clouds and snow landscapes as subject matter. Note: Fee includes a light gourmet lunch & refreshments. A list of suggested materials will be sent to you with your registration confirmation. Other materials will also be available for purchase to compliment your learning. N.B. Sessions fill up quickly! Sign up today! Modified lesson content is available on demand to suit the needs of students enrolled. Just ask Tess. Lessons are filled on a first come first served basis. They are subject to cancellation if minimum enrolment is not reached. Early registration is recommended. Fees will be refunded only if the course is cancelled by the Studio, or by the student with at least two weeks notice before the beginning of the session. Design your own one or two day workshop. Get inspired by Tess. Choose a workshop topic(s) and a date that suits you and get creative. Spend a day or two rekindling your love of the arts while enjoying beautiful Prince Edward County. Have fun experimenting with this versatile medium. Learn brush techniques and handy tips to render your subject. Florals and landscapes as subject matter. 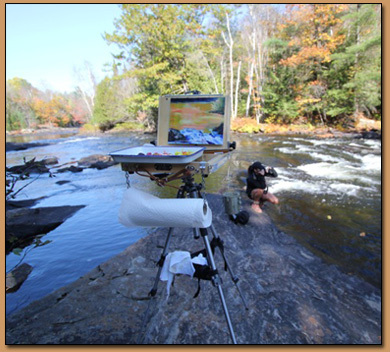 Learn the art of plein air painting! Small groups of 2 - 6 people guaranteed. Lots of fun and one to one attention. Workshops offered all year round. Dates fill up quickly so register early. Contact Tess to design your own workshop today. Note: Fee includes a light gourmet lunch and refreshments. Visa, Amex, Mastercard, Debit and cash accepted. Special Note for above lessons and workshops: Lessons are filled on a first come first served basis. They are subject to cancellation if minimum enrollment is not reached. Early registration is recommended. Fees will be refunded only if the course is cancelled by the Studio, or by the student with at least two weeks notice prior to the beginning of the session. For further information please contact Tess. Thank your clients, encourage new business or bring your office! Great team building experience. Excellent for encouraging creative thinking. Choose a workshop topic(s) and a date, and get creative. Spend a day or two rekindling your love of the arts while enjoying beautiful Prince Edward County. No art experience necessary. Tess will guide you and your invited guests through the whole process. Excellent catering can be arranged through Tess for your event. Contact Tess for more information. Speaker phone available for conferencing capabilities. Everyone will take home their own masterpiece at the end of the day. Lots of fun and one to one attention. Workshops offered year round. Dates fill up quickly so register early. Contact Tess to design your own workshop today. Visa, Amex, Mastercard and Debit accepted. A nonrefundable deposit is required at time of reservation to secure your date. Fee includes all materials for Corporate Workshops. Catering costs are extra. Other materials will also be available for purchase to compliment your learning. Fees will be refunded only if the course is cancelled by the Studio, or by the client, minus the nonrefundable deposit with at least two weeks notice prior to the beginning of the session. For further information please contact Tess.